AEVITA Erase Hard Drive completely destroys sensitive data on your hard disk, without leaving a chance for someone to recover your data. All traces of the data are removed from the disk so that the data cannot be retrieved even by using disk recovery software. Your private information is 100% gone, and your data is completely destroyed. Best of all, it is quick, easy-to-use, and compatible with any PC, independent of OS used! 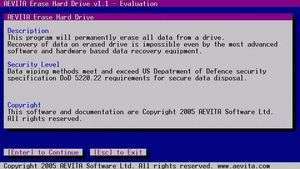 AEVITA Erase Hard Drive 1.1 is a shareware program and can be used as a demo to try the software until the free trial period has ended. A full version of the program is available after the trial period ends. For security reasons, you should also check out the AEVITA Erase Hard Drive download at LO4D.com which includes virus and malware tests. Additional screenshots of this application download may be available, too.